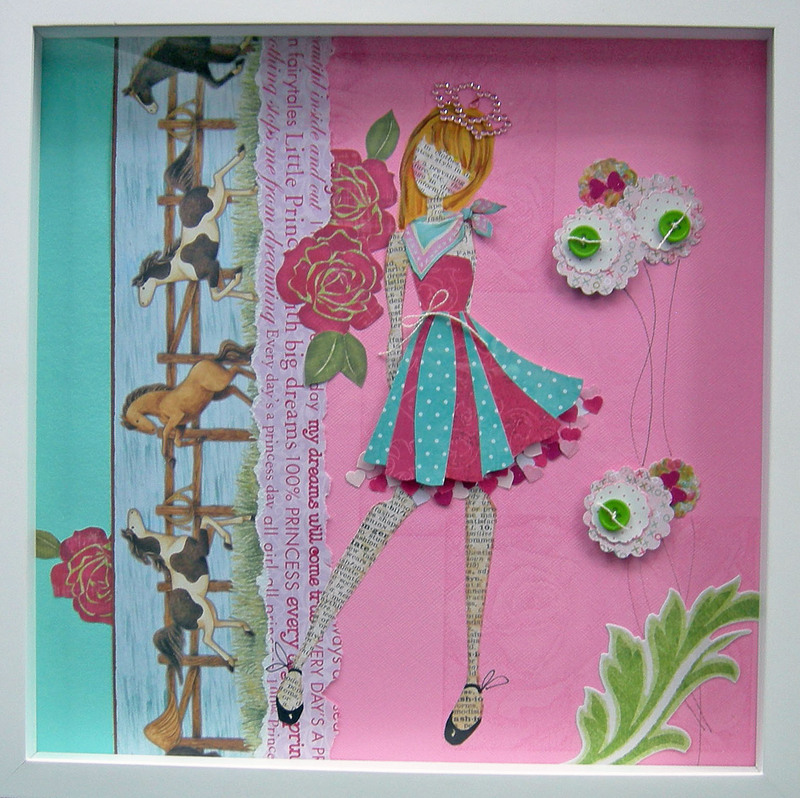 Julie Nutting Designs: Ta Da! Remember the little girl that loves pink, ponies and princesses? The princess is done and has arrived safely in Cincinnati. I actually made 2. The first sat for awhile and everytime I looked at it something just seemed off. The girl seemed too big for the frame, so I decided to do another and choose between the 2 of them. The first picture is the second one that I did. She is wearing a pink rhinstone crown that I found in the clearance bin. I liked it better and framed it in the shadowbox. The first one has a tiny glass vial from a perfume sample that I filled with some vintage flowers. I loved that detail! Now what to do with the first one? Well, I ended up sending that one unframed as a bonus and she can decide. Or frame them both and have a set. My bonus? Very happy client with 2 pieces she is taking this to a trend meeting for the company that she works for....North Light Books! The tiara with the kerchief, ingenious Julie ! Awwwww aren't these just so beautiful??!!! I love them. PINK is the way to go. So sweet. These are both wonderful, but I love the one with the green background! What a lucky little girl! And that's fantastic that her mom works for North light books..wow! I hope that goes well. i love all of the detail you have going on here! so many exciting things are happening for you! Yay! I just got to see this in person at our meeting. So, so cute. There was a collective "awwwww" when she pulled it out of the box. These pages that you are drawing in are looking so cute. Love the colours too! PINK AND GREEN, me and my mom always have to have some PINK AND GREEN in our journals when we create! Hi Julie! These both turned out so cute! I don't know which one I like better and I'm sure she can't decide either! I didn't get to visit you or Lisa during the last show at Christie's. I was by myself most of the time so I wasn't able to walk around much. Hopefully I'll get a chance in March. Oh, I also hope something works out for you from her showing your work to that company. That would be great woulnd't it?! Very very very cute! Love how personal it is. Lucky little girl!